Before you resign yourself to drafting up small house plans, think innovatively about how you can make a large house work on a small lot. If you take a stroll through any of the older neighborhoods in your city – older meaning mid-century or earlier – you will notice something about the homes: the lots are all big, but the houses tend to be a bit on the smaller side, with large yards. Fast forward a couple of decades and you’ll notice that houses started to get bigger, much bigger. Lots were still fairly large, so there was still decent yard space, but houses began running over two thousand square feet, even in fairly modest middle-class neighborhoods. Since then, the story has changed yet again. Due to population expansion in many major cities, new homes are being built on smaller and smaller lots. So what does this mean for you when you’re planning on having a home built? Can you only look at small house plans? Or will you be able to somehow manage something a little bigger? Well, in a way yes, and in a way no. There are still larger lots available in more affluent areas, so if you can afford to live in one of those neighborhoods, you can scrap the small house plans and build something bigger. If you can’t afford the richer areas of your city and are looking in a more standard, middle-class neighborhood, you might not be able to plan a house that appears large or has a high square footage, but you can still build something much bigger and more elaborate than your basic small home. Bungalows might be a popular choice right now, as are split-level homes, which, despite being built upward, still must cover a large surface area, otherwise all those half-floors would simply be too small to be practical. However, on a newer, smaller lot, those might not be options, but before you give up and start drafting up small house plans, consider your other options. Why not plan for a multi-story home? True, those aren’t done very often anymore, but they can be beautiful, sophisticated, and perfectly modest homes. You will have to be careful when making the plans, though. You want to make sure you really consider where you would like everything to be. It might seem simple to just take small house plans and throw on another floor, but unfortunately it’s not quite so simple. You’ll have to consider whether you want all bedrooms on the upper level, or if you’ll need one or more on the main level. You also have to think about your maximum square footage per floor, and what room placements that will allow for. Also consider how many floors you’re willing to have (why stop at two? ), window placement (for privacy), and whether the neighborhood has restrictions on housing styles. In all of these considerations, the size of your family, your propensity for keeping company, your decorative taste, and your physical health will all be considerations. Despite the work involved in changing your small house plans to multi-storey house plans, it will be worth the effort when you live in the neighborhood of your dreams, without compromising the house of your dreams. 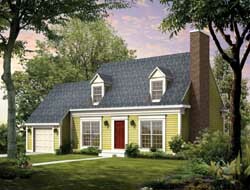 This entry was posted in Small House Plans on September 29, 2012 by HouseplanGuy. You can customize our house plans to meet your criteria. So you’ve been going through house plans and you have finally found the one that you want…sort of. It’s perfect, except for a few small details. You can’t find anything closer to your ideal, but if you could just make a few adjustments, you would be truly happy with your choice. Relax! 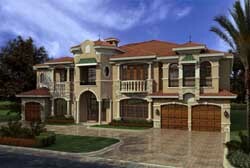 All of our house plans are customizable. Wait! Before you rush off to pencil in that double spiral staircase there are a few things you need to know about customizing house plans. Are you familiar with the term load bearing wall? Let’s put it this way. You don’t want to knock one of those down. Opening up a space by removing a wall is a common way people customize house plans, but if that involves removing a load bearing wall, your house becomes structurally unsound. You don’t have to be an architect to make changes to your plan, because we have ones on call for you. If you are worried about the potential damage from removing walls or beams noted in your plan, talk it over with one of our architects. They will be happy to help you make changes. For example, if it is a load bearing wall you want to remove, perhaps columns or an archway could be installed to keep the house structurally sound. Adding bathrooms, creating guest suites and changing up your building materials are all ways you can customize your house plans. Before you install that five foot fountain in your foyer, however, check to see how much cost your additions are adding to the price of the plans. You will also need to add the cost of your additions into your cost to build. Alternately, removing elements may actually save you money. Our trained staff can discuss costs with you as you customize your house plans. Don’t be afraid to run your ideas past a designer. If you are looking to add something special to your house plans, like a theatre or private pub, you will need to pay attention to things like flow and access in addition to color and décor. Book a consultation with a designer to get ideas on how to install a major feature into your house plans. The consultant may recommend using basement space, or over-garage space. They may hint at direct access off the kitchen for easy access to treats or they may suggest extra wide doorways so equipment can be moved in and out of the room with ease. They will also have suggestions on how to design the room so it can be re-purposed at a later date, if necessary. You may also want to run your customizations past a real estate agent. Sure, a built in fish tank may be just the thing for you, but it may take away from the resale value of the house. If the customizations you choose for your house plans are only suited to a narrow niche of home buyers, talk with our architects about ways your customizations can be easily renovated if you plan to sell at a later date. Most important of all, have fun. This is your house and your house plans. Enjoy the process of making it unique to you. We have the resources you need to quickly and easily customize your plan into the plan of your wildest dreams. This entry was posted in House plans on September 29, 2012 by HouseplanGuy. Browsing house floor plans is exciting but you need to stay organized so you can remember your favorite ones. Is it that special time in your life when you get to look at house floor plans? Much like the day you go shopping for your wedding dress or the day you get your first car or the keys to your first apartment, the first time you go looking for the plans that will eventually be your home is one of the most exciting and memorable days in your life. Unfortunately, much like the first time you shop for your wedding dress (or tuxedo for the gentlemen!) or for your first car, you can become completely overwhelmed with all the options. Here are some easy ways you can stay organized while looking at house floor plans. • Make a budget: You can’t have a dream home that you cannot afford. That is not a dream home; that is a financial nightmare. The stress of living paycheck to paycheck and in constant dread of anything that will strain your tight budget (appliance breakdowns, car repairs, time off work due to illness) will cause you to resent your money pit of a home. No matter what your budget, there is a house out there that has most, if not all, of the elements you need. Before you start looking at house floor plans, decide just how much house you can realistically afford. • Separate needs and wants: You can customize house floor plans to have every whim you can imagine, but is an oversized dining room more important than ample storage? Think about your lifestyle, your family and the ways you need your house to function for you. If you have social children, perhaps you want a basement where they can hang out with their friends. Love to socialize? Then a theatre room or large parlor is for you. Plan your home for form and function before you add in your wants. Needs are things you must have to make your home work for you. Wants are things that are nice to have, but you can live without. Both needs and wants come with a price tag, so plan accordingly and stay on budget. • Search online: Once you have a realistic budget in place and know what elements you want and need in your home, it is time to start browsing house floor plans. Doing so online is the most efficient way to see all your options. Here at Monster House Plans we have many ways to keep you organized while choosing from among our over 20,000 plans. Our advanced search allows you to view only the plans that fit your criteria. You can save plans that you like in a favorites list that is accessible to you each time you log in. • Get information from reliable sources: You are going to have questions as you narrow your selection of house floor plans to your one dream home. Questions about an investment of this importance should only be handled by the experts. At Monster House Plans, you can talk to an architect, not a call center agent, to ensure your questions are properly addressed. We love house floor plans, which is why we have over 20,000 of them! That is a big number, but a few simple steps is all it takes to keep from being overwhelmed as you find the plan that is perfect for you. Craftsman house plans are created using the “Arts and Crafts” lifestyle and philosophy that combines architecture, interior design, landscaping, and applied or decorative arts. This Philosophy became popular at the end of the 19th century and remained very popular until the 1930s. Architects designing craftsman house plans were concerned with unity of the style inside of the home and the appearance of a house’s exterior, especially in relation to its setting or surrounding environment. The Arts and Crafts Movement was concerned with the spiritual connectivity of one’s surroundings whether they are natural or man made. In this way, it made sense that the perfect home for this philosophy would be complimentary to its setting and provide a space to gather inner peace that was far away from the realities of the ugly urban factories where many people worked, and the desolate surroundings of the industrial district. Today there is a revival of interest and lots of people are seeking craftsman house plans to build their own dream house. The craftsman house plans originated in Britain as a reaction against the ornate aesthetics that typified the Victorian era. When the craftsman style house reached the United States they shared the interests of the simplicity of design and accessibility of materials that were often locally available. In addition to these elements, many craftsman house plans will also feature hand-crafted elements such as masonry or woodwork, and often there are mixed materials used throughout the entire structure. It is not uncommon to see a house that features stonework on the front of the house that is set off by white painted wood embellishments. The effect is a very pleasing design that conjures up images of a comfortable and ideal home. Craftsman house plans are typically bungalow designs. This means that they are often detached from garages (although the plans can be modified so that the house is attached to the garage), the houses often feature single or one-and-a-half stories, and a veranda. In modern times the craftsman house plans will also include some design motifs from Frank Lloyd Wright, a very acclaimed architect who was inspired by the Arts and Crafts movement. A famous craftsman design is the Hyland Hotel in Montecito Utah. It displays many of the features that make houseman craftsman plans so appealing including a mixed wood and stone foundation and ornate pillars that nicely frame the front entryway. A craftsman house is a very beautiful design and the houses developed in this style are well made, so many examples of the original styles still exist. Designers know a lot about the craftsman house plans today because of the increased popularity that has been expressed in owning this style of house. The look has become classic, and is associated with peaceful family living. This entry was posted in Craftsman House Plans on September 3, 2012 by HouseplanGuy. Houses these days come in any size or shape that you can dream up, and throughout history, we have been left the legacy of some beautiful homes that have been popular at various times in the past. Today’s dream house floor plans draw on the gifts of those historical homes from all over. English country house floor plans draw on the love and romance of the old English countryside, and the great literary traditions. Remember Pride and Prejudice, or The Remains of the Day, Downton Abbey, Atonement—the manors and the cottages. The grand manor houses were places for relaxing by the fireplace with a glass of sherry after a day of rambling through the countryside. They had multiple rooms, many wings, servant’s quarters and libraries. The cottages were full of warmth and rustic charm. Think timber frames, brick construction, and sloping roofs for this house floor plan. Forget the thatching for the roof though. 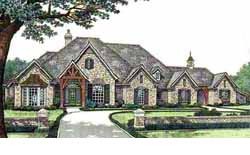 Today’s English country house floor plans use shingles – a safe and effective way to protect the house while keeping all of that old country charm. French country houses were farmhouses, but with elegance, grace and style. They used natural materials, rough plaster and wood for the construction and the furniture. Large rooms and French doors and windows allow you to grandly throw open the shutters and welcome the world into your home. When you think of an Italian house plans, you think of the garden that is easily accessible from the house – wide doors that open up to a stone patio that is an outdoor extension of the kitchen, for a large family meal or just for easy access to the herb garden. Stonework, low-pitched, flattened roofs, tall with many stories, and maybe even a cupola are the attractions of this house floor plan. Gables, cornices, friezes and columns. White paint. These set the Greek Revival house floor plans apart from the others. Imagine a cultured back garden with tiled pathways and a few statues. What do you think of when you see a red-tiled roof, arches over the windows and doors, exposed wooden beams and glorious color inside? How about a Spanish hacienda? Spanish house floor plans look part of the scenery in hot climates, and their deeply shaded porches make them inviting. 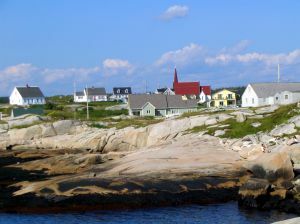 All of these styles, from all over the world, have their place in America’s housing history. But America has some house styles of its own that are popular as well. The Cape Cod House Plans from New England that were popular in the 18th and 19th centuries. These are small, economical and charming. Early American style house floor plans incorporate many of the historical stylings of the past. But other houses show purpose or need of the area in their style, such as the log house, ranch house and beach house floor plans. House floor plans can be anything. This listing is not all of the styles of house floor plans available at Monsterhouseplans.com. They have over 22,000 different styles to choose from, and each one could easily be the house of your dreams. All of these plans and more can match your style, whether you are looking for a casual relaxed home, or an ornamental, opulent luxury house. Take a look that the styles and see what you can dream. This entry was posted in House plans on September 3, 2012 by HouseplanGuy. If the whole buying process is getting a little bit too much for you then you can enlist the help of a real estate agent to help you find your dream home. Not only will they help you to find a new home, but they will help with the bidding process too, and their professional experience could go a long way here! If you don’t have children then this may seem like a strange thing to do, and if you do have children, it will seem like a very obvious thing to do. The fact is, that homes near schools are always in high demand, so if you want to sell that house in the future it will be a lot easier, and you may even get an increased price for it. There is nothing worse than buying your dream house and then finding out you are going to have to spend a fortune on house repairs because you didn’t know about the house’s structural problems before you bought it. Don’t be blind sighted by the need to buy a house quickly, employing a house inspector to look around prospective houses may save you a fortune in years to come. Niqui Stubbs is a medical student with a passion for home interiors, who also works for a company called Search Laboratory. She has lived in 4 rented houses in the past 4 years and is now looking to buy a house of her own. She also loves writing about interior design, as it is what she would have gone into if she wasn’t going to be a doctor. She is currently writing for Agent Find, a company in Canada who are dedicated to helping their customers find the perfect estate agent in order to sell their house, or buy the home of their dreams. 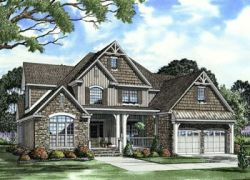 This entry was posted in Home Buying, House plans on September 2, 2012 by HouseplanGuy.